Meet your neighbor Chelsea Stewart of Lincoln, Illinois formerly of La Harpe. Chelsea was born on October 4, 1991 at McDonough District Hospital in Macomb. She is the daughter of Kelly Davis of Atlanta and Donnie Stewart of La Harpe. Her mother Kelly is a registered nurse for Hospice and her father Donnie works at Dresser Rand in Burlington, Iowa. Chelsea attended La Harpe High School her freshman year and graduated from Illini West High School in Carthage in 2010. In high school Chelseas' junior year, she received her C.N.A through Carl Sandberg College. Chelsea is currently employed at Symphony of Lincoln Nursing Home as a C.N.A. She plans to attend nursing school in the fall of 2015 to further her career in nursing. She formerly has worked at McDonald's Restaurants as a trainer in the management program. 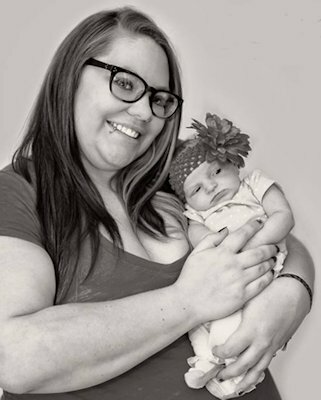 Chelsea's family consists of her 7 month old daughter, Dahlia and her boyfriend of a year and half, Dylan Adkins. Chelsea is from a large family and has 7 siblings. They include (mixed family), Michael 24, Brianna 16, Katelyn 15, Abigail 15, Naomi 12, Levi 10, and Tomie 7. Chelsea's grandparents are Florence and the late Donald Stewart of La Harpe and the late Doug and Joyce McCoy of Dallas City. She enjoys playing slow pitch adult league softball, playing video games, and going to the park with her family. She also enjoys making blankets. Chelsea's favorite memory is when her daughter was first put in her arms. It will always remain a precious memory.